Krista McCuish is a photographer based in coastal Nova Scotia, Atlantic Canada. She is a critical care nurse and geologist by profession and when time allows, she explores in the wilderness inspired by Nature’s detail and the natural processes at work. Always curious, she attempts to bridge her creative side with her science background to express more about her place in the world. Amid the big vistas and intense interpretations that dominate some platforms, there are quieter voices. We’ve featured some of them before and in this issue are returning to Canada* to speak to Krista McCuish in Nova Scotia about what she refers to as ‘the art of noticing’. For those that find the North truly magnetic, the idea of limitless wetlands and coastal areas where nature still holds sway may just make you a little envious. Can you tell us something about where you grew up and live now, and the extent to which this has shaped you and your interests? I was born and raised in Halifax, Nova Scotia, on the coast of Atlantic Canada. My home was surrounded by woodlands and lakes and I lived the life of a free range child. My earliest recollections of this time involved running wild in a pack of children, roaming far, with the only limit being our imaginations. This meant we were always exploring and discovering and attuned to everything nature had to offer. I’ve lived in numerous cities in Canada and the US while following career paths with the intention of moving back permanently to the area where wild spaces are still plentiful and where it is easy to leave urban life behind. I have been back in Nova Scotia 10 years now and I live in the woods much the same way as where I grew up. When time allows, I wander with and without a camera. I find myself taking in elements and their details and visualising them into an image based on what I know or what I want to understand. The camera is my tool of choice and a way to express myself through images that bring meaning to where I am on the path of life. Where did your education take you initially, and what prompted you to go on to further studies? Did the later courses influence or alter your relationship with your environment at all? When I finished high school, I joined the Canadian Armed Forces on scholarship as a means to fund my science degree in nursing and also earn a living at the same time. I had a fear of uncertainty of what path to follow and I desired financial security. I went on to receive a varied experience as an army nurse specialising in aeromedical evacuation and critical care nursing. This career path had its rewards, but I eventually felt restless and began to live for my infrequent days off. My structured and disciplined life became stifled and I felt severed from the natural world. After nine years, I started anew and over the next decade, I completed a geology degree and pursued studies in environmental toxicology. My life became filled with field and thesis work and I was outdoors where I wanted to be. My critical care background is often invaluable, and I continue to draw on it, in all aspects of my life, especially in medical emergencies. My later studies have pushed me to delve more deeply into the how and why of natural processes and how these shape the landscape around us and our place in it. My life has gone from busy multitasking and critical decision making to a slower pace of unitasking and the art of noticing. When did you become interested in photography and what kind of images did you initially set out to make? How much time are you now able to devote to photography? I bought my first camera (Canon AE-1 film camera) in high school and quickly taught myself the technical aspects and basic darkroom techniques. I was enthusiastic and loved making images of nature but I wasn’t focused and, in many ways, too hungry and impatient for results which left me disappointed. I documented travels, and outdoor adventures without any real artistic intent. I knew then that photography was something I wanted to use as a creative outlet, but as I pursued my career there were many fallow periods. It has only been in the last 5 years that I feel my photography has moved past the snapshot and is more about a restless curiosity attempting to bridge my creative side with my science background. In the last three years, my photography has suffered short lulls for sure. Life events such as losing loved ones and caregiving responsibilities when cancer strikes the family have left me heavyhearted and taken a toll on the creative flow. Looking ahead though, creativity usually returns, especially when I take the time for exploring in solitude and can just ‘be’. Where do you most enjoy exploring, and what can you find on your doorstep? My favourite places to explore involve water in all its forms. Nova Scotia is almost completely surrounded by water and still largely wilderness. Being almost half the size of the UK, finding limitless wetlands and coastal areas is quite easy. I find myself on the coast exploring coastal barrens and tidal pools, bogs, ponds, riverbanks, and many unnamed brooks. The fall and winter are my favourite times to explore. The sun is lower and produces magical light, and I prefer the cold and wet over the unpleasant heat, biting insects and harsh light of spring and summer. I often go repeatedly to the same locations to understand the changing forces at work and to build on projects I’m working on. Sometimes I don’t have to venture very far to find interesting subjects. I have been easily distracted by textures in my garden during spring thaws. The overwintering plants and their textures can be a feast for the eyes. My first inspiration in photography was Freeman Patterson. I still remember reading his words in the Photography of Natural Things about experiencing what nature has to offer and bringing your own interpretation into images. I didn’t know at the time that visual literacy would take decades to transcend and the process never stops! The first time I heard the term “intimate landscape” was when I saw the early work of Eliot Porter. His seasonal approach to seeking out the usually unnoticed beauty around him and forsaking the sensational resonated with my sensibilities. This led me to read the books of David Ward and his ideas of simplicity, mystery and beauty as attributes in images. After that, Guy Tal’s essays in More than a Rock gave me many more things to think about, especially the notion that we can deny ourselves a full range of experiences if we limit our artistic intent to a narrow mindset or purpose. I know I can be prone to this thinking at times and have to consciously move past it. Another aspect that has inspired me and driven me forward is becoming knowledgeable about earlier photographers/artists, and especially those who carved their own path by staying true to themselves. The names that immediately come to mind are Eliot Porter, Harry Callaghan, Robert Frank, Georgia O’Keeffe and Saul Leiter to name just a few. You’ve written in one of your web galleries that “coming from a part of the world where one’s images need to shout to be heard, seemingly goes against an ingrained quiet and thoughtful approach to creative expression”. How important do you feel it is for photographers to stay true to their own personality and interests, and to see where this leads them, rather than chase the crowd? Much has been written about the sensational versus the subtle or images that shout rather than whisper. In photography, there will always be both, although I prefer the latter, so it is important for me to stay true to my own interests and hopefully, that will come out in my work. Much has been written about the sensational versus the subtle or images that shout rather than whisper. In photography, there will always be both, although I prefer the latter, so it is important for me to stay true to my own interests and hopefully, that will come out in my work. I can only hope to accomplish this by doing the best I can to express myself the best way I know how. I do this by exploring wild places often in solitude and prefer images born from a quiet and studied approach – as Rainer Maria Rilke writes “…your solitude will be a support and a home for you, even in the midst of very unfamiliar circumstances, and from it you will find all your paths”. As you may know, we spend a lot of time in the UK grumbling about weather and don’t cope well with snow. What is a real winter like and what adjustments do you make to keep active – and safe – in pursuing your interest? To some people, winter here is just a long, bitterly cold battle to be conquered by hot chocolate (or beer) and staying indoors. Others grumble and head south on vacation to escape the temperatures and snow. You might have guessed, I love winter! Our winters have become highly variable. Sometimes we have many snowstorms that accumulate snow into high banks and everything freezes up solid. This is perfect for winter sport since we are huge ice hockey fans and love to toboggan and snowshoe. Other winters are marked by frequent winter rains and only a few weeks of cold below -15C. I prefer to take each day as it happens although I will admit that winter undeniably forms an integral part of who I am and what I do. I have been known to get an occasional soaking when I have overestimated ice thickness and slippery rocks, so I’ve had to be wiser in that regard. I prefer to follow waterways and the paths of wildlife when I explore, so I carry maps and a GPS. I have been lost several times, but never for very long. I think that comes with the territory. You have to know how to navigate using nature’s signs in addition to maps and modern technology to problem solve and find your way. It is also useful to have a good working knowledge of edible plants and fungi as well as being able to track wildlife. These are all good ways to notice what is around you and coexist harmoniously with nature. I think it’s safe to say that you have a bit of a thing for ice ;-) Most of us know that the Inuits have many words for snow, but perhaps not that the name for ice varies too according to its type and location? Yes, you are definitely right about that! I wouldn’t call myself a pagophile, but ice can certainly fascinate. It can be brittle. It can flow like honey. It can support huge weight and carve rock. It can last for thousands of years or disappear in seconds. Snow and ice terms are used together and the ones that interest me most have a cultural context. They tend to be a combination of dialect, specific weather conditions, and distinct phenomena. I like the sounds of them and how their descriptive use shapes the sense of place. I’ve collected many words over the years of photographing ice. Snow and ice terms are used together and the ones that interest me most have a cultural context. They tend to be a combination of dialect, specific weather conditions, and distinct phenomena. I like the sounds of them and how their descriptive use shapes the sense of place. On an early April morning, I was following a strand line at low tide along a beach on the southwest coast. The sun was still low enough that all tracings of periwinkles and sand worms were illuminated. I abruptly stopped when I saw this trail. The meandering nature was very different than the rest of the marks on the beach. In a figurative sense, it resembled my life’s journey. You can be on a set path, then become disoriented and find yourself going in circles. Eventually, things have a way of working themselves out and you carry on, all the better for the experience. Then I think of the tides and how they leave traces that only last between one tide and the next; the only thing certain is change and seeing things anew every day. I was exploring a boggy wetland in March after a rapid freeze where the temperature dropped quickly to below -10C after a rain. In this case, over the course of a kilometre, there were thin sheets of ice over the shallow river. The sheets revealed incredible flowing lines in the ice. It made me think of ice poems or nature’s lines of writing in the most imaginative sense. One January morning the landscape was bare of snow after a rain in between snowstorms. The temperature and humidity was perfect for frost formation, so I wasn’t surprised to find a light coating of frost on everything in the forest. When I came upon this scene, it struck me how fragile it was. I could have easily stomped across it and kept walking down the path, but I stopped and was mesmerised by this miniature frost world with details of delicate frost covered fern, moss, needles, leaf remains and red lichen adding a subtle splash of colour. Tell us a little about the cameras and lenses you like to use and how they influence the images that you make? Has this changed over time? I currently use a Canon 5D Mk III. My most used lenses are the 100mm and 65mm macro to make images of ice and other fine details in nature. I prefer to use live view and magnify to achieve critical focus. As time goes on, I have become more and more meticulous about sharpness and focus in my macro work because it is essential for me to express depth of detail in shape, texture, and patterns. I want the viewer to be able to wander around in the details, see processes at work, and the infinite possibilities in nature, but I think this is my science mind coming out! At times this can be challenging and necessitate the use of focus stacking with software such as Helicon focus. For experimenting with water flow imagery, I use a 90mm tilt shift lens and love the tinkering and slow approach of making manual adjustments to achieve the amount of movement and focus I want across the image. Water requires a certain amount of study because so many factors influence flow. A favourite subject in water is swirling foam (plant saponins). Sometimes I see large shallow slow moving pools of foam that, when rendered as an image, resembles a fine spirograph. Nature can sometimes produce fine art in the abstract. My lens selection has definitely changed over time. I rarely use zooms and really must get on with selling them. I have become more particular about the lenses I use, but at the same time it is a balance between ‘what works well enough’ and not becoming obsessed with technological developments. I suspect like many others I will go to a mirrorless camera option when the weight becomes bothersome for hiking far distances. For now, I keep the weight down by only taking two lenses at a time and using a lightweight Gitzo tripod. Can you give readers an insight into your workflow from the point of image capture to output? I use Camera Raw, Adobe Bridge and Photoshop CS6. I will upgrade when I have to, but for now it does everything I need. I work in layers, sometimes use masks and blending tools with basic adjustments in curves, hue/saturation, and colour balance. I often use smart objects to save time later if I want to go back and re-edit the white balance in Camera Raw or make small adjustments as in sharpening certain areas of the image. I do enjoy Photoshop for the many different possibilities for doing similar things. Processing images in black and white is an example. I used to shoot film and develop my own images in a dark room and now Photoshop is just a different way of visualizing the final image. This is sometimes achieved with multiple images and/or intentional camera movement. Is it important to you that other people see your work in print, and how do you choose to print and present your pictures? I think producing prints is very important. It’s the final step in the process of making an image. I still use the old workhorse of a printer, the Epson 3800, and a variety of papers. There was a time when I wanted to make large prints for shows and festivals with a larger printer – the bigger the better! Somehow that started to feel “too shouty” and less intimate for my work, so for now, I print to a maximum of 12” x 18”. I want my prints to draw in the type of viewer who wants to step closer and study the image to become intimate with the workings and wonders to be discovered in nature. Recently, I had the opportunity to have my mushroom prints on the front and back covers of Bowdoin Magazine for their Spring/Summer 2018 edition and I was very pleased with the printed result in magazine format. I don’t actively seek publication and print sales, but certainly, appreciate the recognition that comes when someone reaches out and wants to purchase a print or images for personal or commercial purposes. I have a large cabinet full of nature collections that I guess you could call a cabinet of natural curiosities. I would like to use photography to express relationships between some of these natural things. Do you have any particular projects or ambitions for the future or themes that you would like to explore further? I also have an upcoming group show in January focused on the ice. It will be an interactive show with the sounds of lake ice on audio, videos of ice phenomena, and my detailed ice images. If it coincides with a snowstorm and we need to snowshoe there on opening night, it will be perfect! Last May, I wrote a journal post for Kozu Books titled Ice World in the Barrens. This gave me the idea to make my own journal in the form of a mapping project with images and multimedia in print form. It is a map from one place to the next and is turning into a self-reflection about finding my way and asking questions and less about getting lost in the unknown looking for answers. If you had to take a break from all things photographic for a week, what would you end up doing? What other hobbies or interests do you have? Aside from spending time with my family, I love wandering. I could quite happily wander for a week if I had no other responsibilities. If I wasn’t carrying camera gear in my pack, I would fill the equivalent space with books. Gardening and playing the piano are two other interests that fill the free moments. What was the last image (by another photographer or artist) that stopped you in your tracks? Freeman Patterson’s “In my Mother’s Memory”. His image of dying hostas grabbed my attention before reading his title and description because I am drawn to the texture and feel of decaying plants. I know I feel a subtle emptiness when everything is finished for the season and dies in the garden. The next thoughts are of the change of seasons and what spring will bring. And finally, is there someone whose photography you enjoy – perhaps someone that we may not have come across - and whose work you think we should feature in a future issue? They can be amateur or professional. I enjoy the work of Chris Murray and Thomas Fleckenstein. I’m sure you’ve seen the images of both. 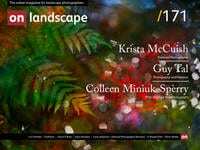 Chris wrote an excellent article for On Landscape called, “The Confident Artist”. Both people approach photography as quiet explorations in nature which I can relate to quite easily. For more head to Krista’s website; as well as images, this will give you links to the social media platforms that she is active on. *We’ve previously featured Canada-based husband and wife Larry and Kathleen Pickard, Franci van der Vyver, and Kyle McDougall and you can read the interviews using the links provided.